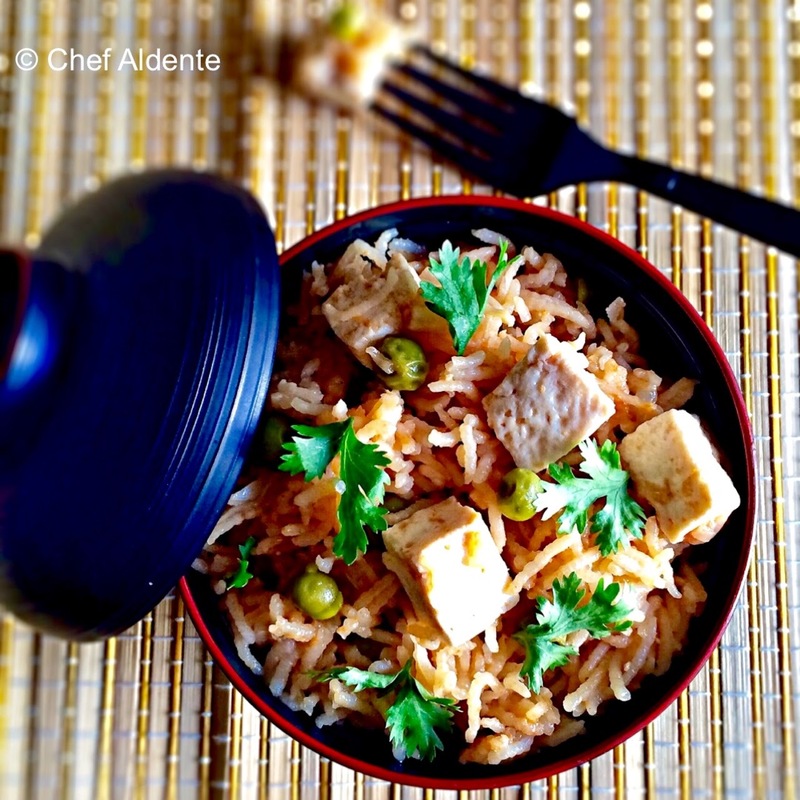 This is a mildly spiced pulao with chunky pieces of paneer and sweet green peas. Adapted from Tarla Dalal's recipe for Paneer pulao, what makes this different is that it is pressure cooked :) So this is an apt recipe for one of those lazzzzzzzy days! The actual recipe says you have to cook the rice for two whistles but I think this would vary with the pressure cooker and the rice used. Mine turned out to be a bit mushy so I would only cook it for one whistle next time. Even then it tasted finger-licking good. Great flavours! You can also find Tarla Dalal's video here. She is such a sweet lady :) Love the presentation and her style of cooking. Check it out! Add the onions and sauté for 2 to 3 minutes till they turn translucent. Add the ginger, garlic and green chilli paste and sauté. Add the tomato purée, green peas and paneer cubes and sauté again. Add the rice and gently fry for few seconds. Then add 2 cups of hot water, salt, garam masala and yoghurt. Mix gently and pressure cook for 2 whistles. (I suggest you cook it for one whistle and if its not cooked then cook it for one more as my rice turned a but mushy after two whistles). Garnish with chopped cilantro and serve hot with raita and pickle. 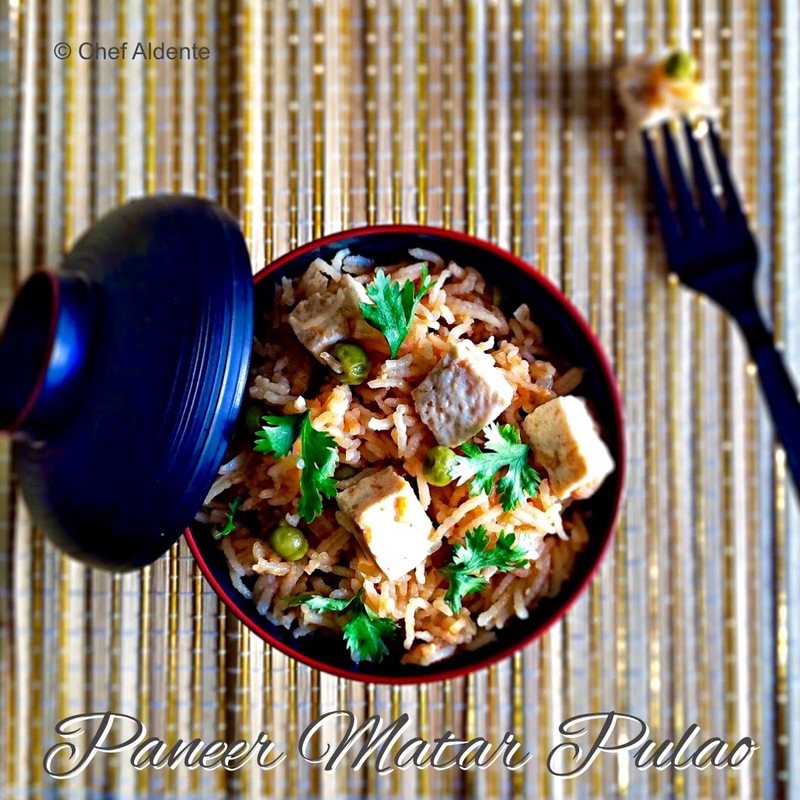 Love this combo, delicious pulao..
Love this pulav. Nice masala n rice combo.